Today’s Easter Egg Roll at the White House had everything: The Easter Bunny, lots of Easter eggs, and... stormtroopers? 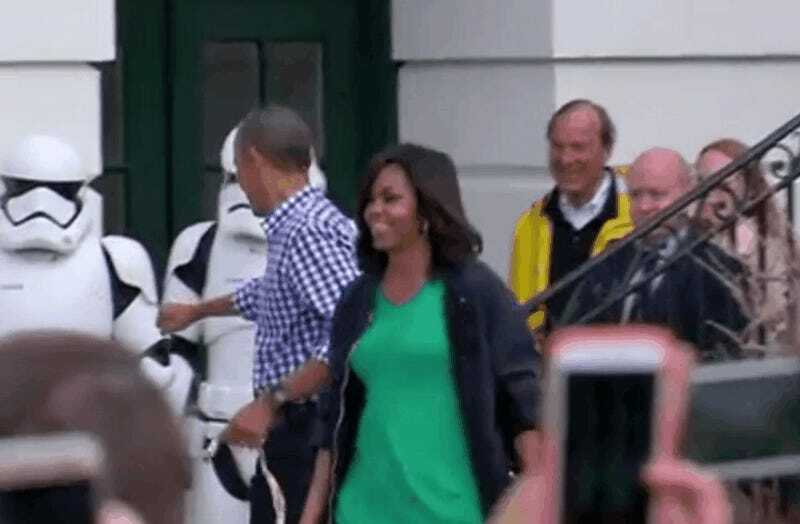 For some reason Star Wars stormtroopers keep showing up at Obama events. But the weirdest part might be that Obama hasn’t even seen The Force Awakens yet. President Obama has said in the past that he saw the original Star Wars when he was 14 or 15. And he has insisted that his favorite Star Wars character is Han Solo. But that doesn’t explain why stormtroopers keep popping up at Obama events like today’s Easter Egg Roll. Which side are you on, Mr. President? Because it looks like you’re palling around with The Empire while only paying lip service to the forces of good like Han Solo and the Easter Bunny. To be fair, the press conference of lies in December also featured R2-D2, but we have to assume that the poor robot was being held hostage. So what is it, Mr. President? Have you seen The Force Awakens yet? Do you plan to? Star Wars has actually played an important role in presidential politics ever since President Carter watched it with Egyptian president Anwar Sadat in the lead up to the Camp David Peace Accords. Perhaps most importantly, it’s time to decide who you’re with, Obama? Because we don’t see Rey or Finn at any of your events.